We are holding a Savoury Scottish Festive Canapes tasting event…combined with a wee bit of late night shopping to help make your life easier. There are a limited number of tickets so buy your ticket today! 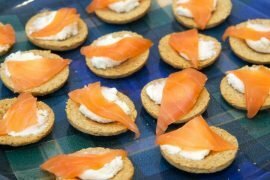 We have collaborated with Ann Scott to create canapes that highlight some of our favourites like smoked salmon while also sneaking in a couple new flavours and textures that may surprise your taste buds and create new foodie memories for all of us. You will also receive copies of Ann’s recipes. Here’s the fancy shmancy link to buy your ticket today!